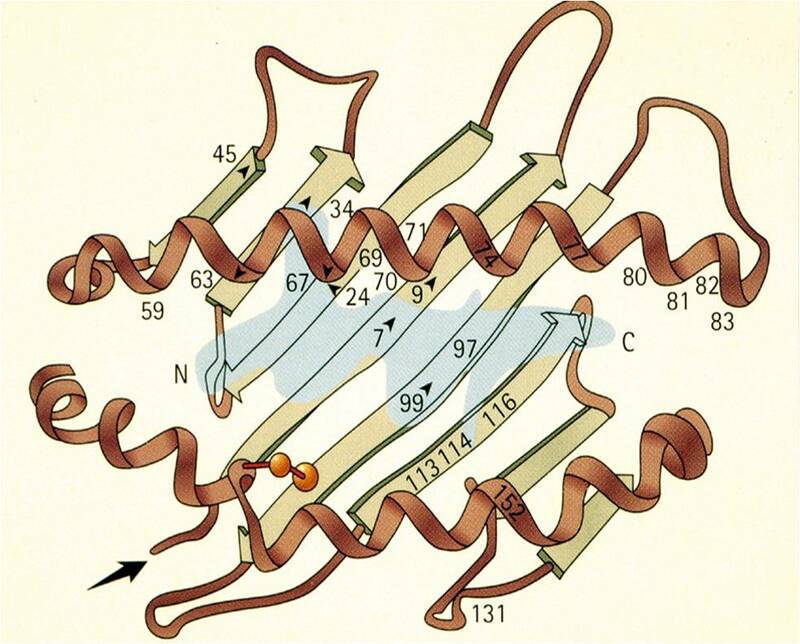 HLA-B27 (an abbreviation for "Human Leukocyte Antigen B27") or HLA-B*27 (according to the most recent nomenclature) is one of the HLA class I surface molecules encoded in the B locus of the major histocompatibility complex (MHC) on the short arm of chromosome 6 (Fig. 1). It is distributed worldwide but with variable prevalence. It was discovered in 1969, and 4 years later was found to show a remarkable association with ankylosing spondylitis (AS), and related diseases grouped under the term “spondyloathritis” (SpA). But among individuals born with this gene, an overwhelming majority never develops these diseases. One of its functions is to present antigenic peptides to T-lymphocytes (Fig. 2). HLA-B*27 shows a remarkable polymorphism, with an ever-increasing number of alleles (variants) that show marked differences among racial and ethnic groups worldwide. As of January 1, 2017, there were 213 known alleles of HLA-B*27 based on nucleotide sequence differences. However, at the translated protein level, there were 160 known subtypes based on one or more amino acid sequence differences (because some of the mutations are located within introns and thus are silent, or they occur in exons but do not cause amino acid changes).These 160 subtypes can be encompassed by the numbering assignment of LA-B*27:01 to HLA-B*27:161 (because one of the assignments—HLA-B*27:22—was subsequently withdrawn when it was found to be identical to HLA-B*27:06). Some of these subtypes exhibit differential association with AS, and there may even be some level of hierarchy in this regard. HLA-B*27:05 (specifically the HLA-B*27:0502 allele) is the most widely distributed disease-associated subtype in the world and has been the subject of most studies. The other relatively common disease-associated subtypes are HLA-B*27:02 (Mediterranean populations) and HLA-B*27:04 (Chinese and other Asian populations). HLA-B*27:05 and HLA-B*27:02 seem to confer equal susceptibility to AS in Caucasian populations, but among Chinese populations, HLA-B*27:04 has been clearly demonstrated to show a stronger association with AS than HLA-B*27:05. HLA-B*27:06 (a relatively common subtype in south-east Asia) and HLA-B*27:09 (a rare subtype found primarily on the Italian island of Sardinia) seem to lack association with typical AS. 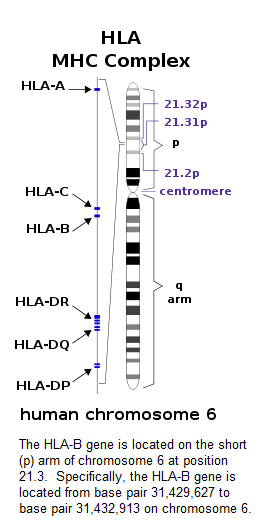 Among the rare subtypes HLA-B*27:01, HLA-B*27:03, HLA-B*27:07, HLA-B*27:08, HLA-B*27:10, HLA-B*27:13, HLA-B*27:14, HLA-B*27:15, HLA-B*27:19, HLA-B*27:23, HLA-B*27:24, HLA-B*27:25 and HLA-B*27:49 are also known to be disease associated, or at least one or more AS patients possessing one of these subtypes have been observed. Most of the remaining subtypes are either too rare or are too recently described to have been evaluated for disease presence or association. HLA-B*27 represents a family of closely related proteins encoded by an ever-increasing number of alleles; not all of them are disease associated and an overwhelming majority of patients with this gene remain unaffected. Clinical diagnoses can be made in most patients with AS on the basis of the clinical history, physical examination, and radiographic or MRI findings. Testing for HLA-B*27 test cannot be used to screen an asymptomatic population to detect AS and related diseases, and the test should not be used as a routine diagnostic test. In certain patients the HLA-B*27 test, when used properly, is of clinical value as an aid to further supporting or rejecting a diagnosis of AS. A positive test result does not absolutely confirm the presence of AS; it merely provides a statement of increased probability of the existence of AS in a patient with appropriate symptoms. The test is therefore most useful to physicians who understand the use of probability reasoning in clinical decision making. - Khan MA. Polymorphism of HLA-B27:105 subtypes currently known. Curr Rheumatol Rep. 2013, 15(10):362. doi: 10.1007/s11926-013-0362-y. - Khan MA. Remarkable Polymorphism of HLA-B27: An Ongoing Saga. Curr Rheumatol Report. 2010; 12: 337-41. - Khan MA. Ankylosing spondylitis and related spondyloarthropathies: The dramatic advances in the last decade. Rheumatol. 2011;50:637-9. - Khan MA. HLA and spondyloarthropathies. In Mehra N (Ed). The HLA Complex in Biology and Medicine Jaypee Brothers Medical Publishers, New Delhi, India. 2010: pp. 422-446. - Khan MA. ANKYLOSING SPONDYLITIS. Oxford University Press, New York, NY. 2009; pp. 1-147. ASIM also happens to be the middle (given) name of the chief consultant for this website, Professor Muhammad Asim Khan, MD, who has suffered from severe form of AS himself for 59 years. Disclaimer: This information is provided for general medical education purposes only and is not meant to substitute for the independent medical judgment of a physician relative to diagnosis and treatment options of a specific patient’s medical condition. This information does not represent an endorsement by ASIM or this website or its consultants. In no event will ASIM or this website or its consultants be liable for any decision made or action taken in reliance upon the information provided through this website.